Welcome to LeElla Lanes the home of Amore' Pizzeria. LeElla Lanes is a family owned and operated bowling center just west of Washington Court House across from the Fayette County Fairgrounds. 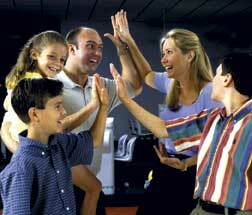 We offer open bowling, leagues for adults and youth, birthday parties for all. We offer the business community a place for corporate holiday parties or team building. Amore' Pizzeria offers the best pizza and subs in town and also caters a wide menu. You can call 740-335-2580 or 740-335-2581 to book your event or for more information.